Partial government shutdown directly impacts Indiana farmers. 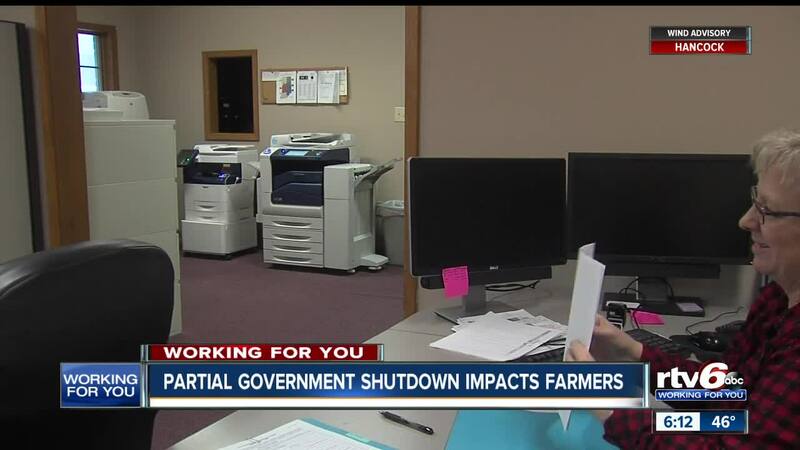 GREENFIELD — Indiana farmers are among th thousands of Americans directly impacted by the partial governemnt shutdown. Subsidies that farmers have coming to them because of President Trump's tariff war with China, are administered by the Farm Service Agency that will shutdown at the end of the workday on Friday. Ronnie Mohr's farms 2100 acres of corn and 2100 acres of soybean. Subsidies are available to offset President Trump's tariff's , but the Farm Service Agency office in Greenfield is due to close at the end of Friday's work day. Mohr says that his farm will survive, but others who were not prepared for this, may not be. "If this goes on a couple more weeks there will be people who will have a tough time of it," Mohr said. " Who never put enough back for one reason or another, who work for the federal government, who will have a tough time of it." Mary Evans is one of those people. Evans has worked for the Department of Agriculture for 32 years. "Probably a week or so would be alright. Much past that it starts to be a hardship," Evans said. " Then we have to come back and take care of all that [claims], take of it plus the additional workload coming in. It is a bit of a strain and I'm older." Jim Fair is also a soybean farmer in Greenfield. Fair's organic soybean crop is late and he hasn't applied for the subsidy yet, but he will. He hopes that when he does, the government will be open. He hopes that there will be a tariff free market again, as well. "I wish all the politicians would quit worrying about the games and worry about their constituents instead of playing games among each other."